I’m sure that I might be forgiven for at first supposing that this week’s topic, “Class Resources and Intellectual Property”, might prove to be a little dull, but I was wrong. Before reading Chapter 8: “Copyright, Intellectual Property, and Open Educational Resources”, I watched the signposted video of Lawrence Lessig’s 2007 TED Talk, “Laws that Choke Creativity”. Immediately, I was captivated by the idea of remix that was presented and what this means, not just in terms of the law, but in terms of culture and what it means for teaching and learning in a digital age. New digital tools give us the ability to create new kinds of digital texts or artefacts, which often incorporate and appropriate the works of others. Referred to as ‘remix’, this practice of borrowing and building on existing works is becoming very common. However, remix, rather than simply being seen as a matter of copying, and akin to plagiarism, is much more than that because it requires a creative re-working of the original material so as to take on a new meaning and/or significance in a new context. There are some excellent examples of this in Lessig’s presentation. The concept of remix made me think of the digital reincarnation of Bloom’s taxonomy, which has ‘creating’ as its pinnacle. What’s more interesting, the suggested verbs and associated activities within the high order thinking skills category of this digital taxonomy refers specifically to remixing. And not only that, but to other activities that might reasonably contain elements of ‘borrowed’ content in their production as well. In order to address the fact that in terms of ‘remix culture’, the law severely constraints the creation of new texts and artefacts, Lessig and others have developed the ‘Creative Commons‘ licensing system. The system makes licenses available that clearly describe what intellectual property rights the creator would like to reserve. So, in terms of teaching and learning, if either students or faculty are creating digital products along the lines of ‘remix’, it seems sensible to ask them to make themselves familiar with fair use guidelines, reference what they have incorporated from elsewhere and publish to the internet with the appropriate licence. I’ve found this to be not only a fascinating topic, but to be an important one as well. And, although I learnt plenty this week, it’s an area that I’ll have to become better familiarized with, along with issues of accessibility that were also signposted in this week’s reading. POT Cert Week 11: creating digital objects for teaching and learning – copyright and intellectual property implications of remix culture by Helen Crump is licensed under a Creative Commons Attribution-NonCommercial-NoDerivs 3.0 Unported License. I am glad to see I am not the only person who found this topic fascinating. 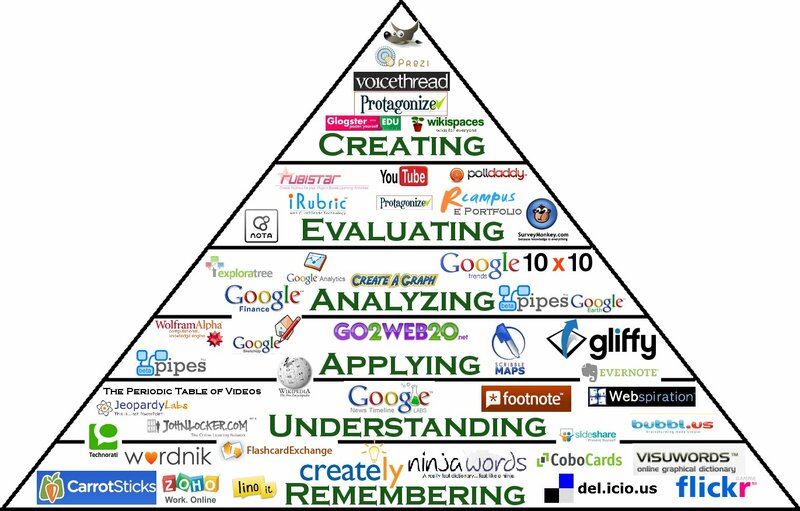 I found the reference to Bloom’s Digital Taxonomy to be very interesting, I have not see that before. Thank you for sharing.